Such a dead-simple design…sill, rim joist, joists. Attach and feel joy and pride. But even though I picked out good quality lumber (straight and true), it STILL wanted to move around, go askew, and even fall on me for a little laugh. 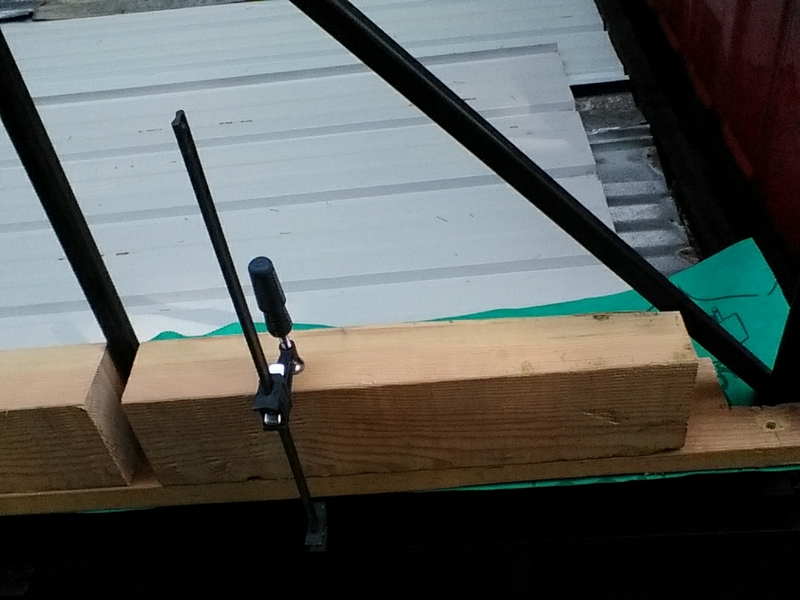 But I have something that conquers working alone with lumber, even 10ft lengths of 4×6: clamps! Clamps are the single most helpful tool a person working alone can have, I swear. Looks all nice and innocent, doesn’t it? What a fight to keep the pieces all where they belonged! 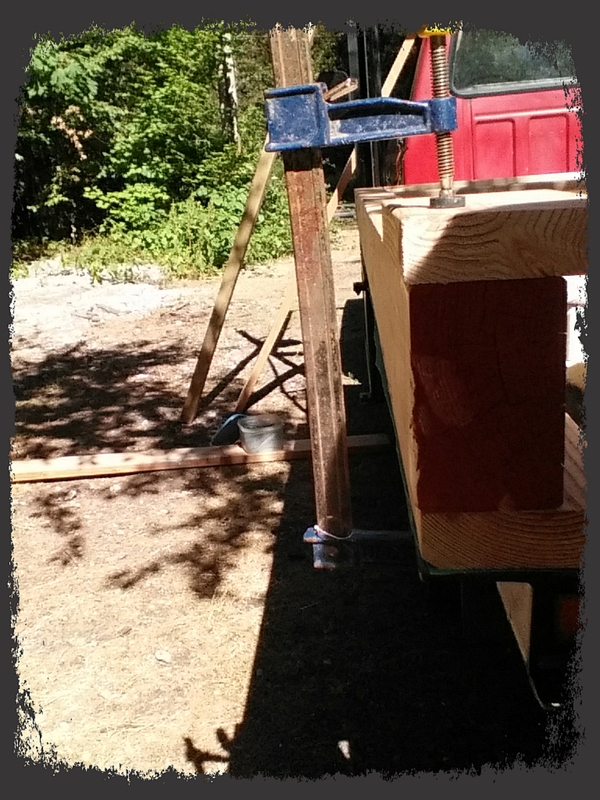 Had to figure out how to drill through 7″ of wood with a 5″ spade bit. Clamps and a couple of scrap wood pieces help (and a hammer to pound things into place). I found more saved up stuff that came in amazingly handy. I used to haunt the local ReStores in the area, and I especially liked buying nails and screws and whatnot. 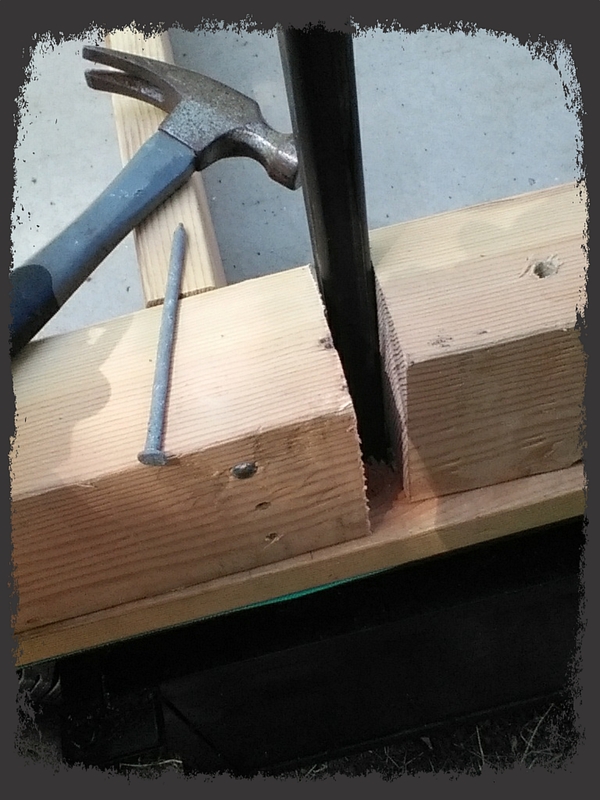 I have a big container of 6″ long hot-dipped galvanized “nails” (more like spikes) that I got for about $5, and they ended up working perfectly for the joining the joists to the rim joist (remember, I used a 4×6). 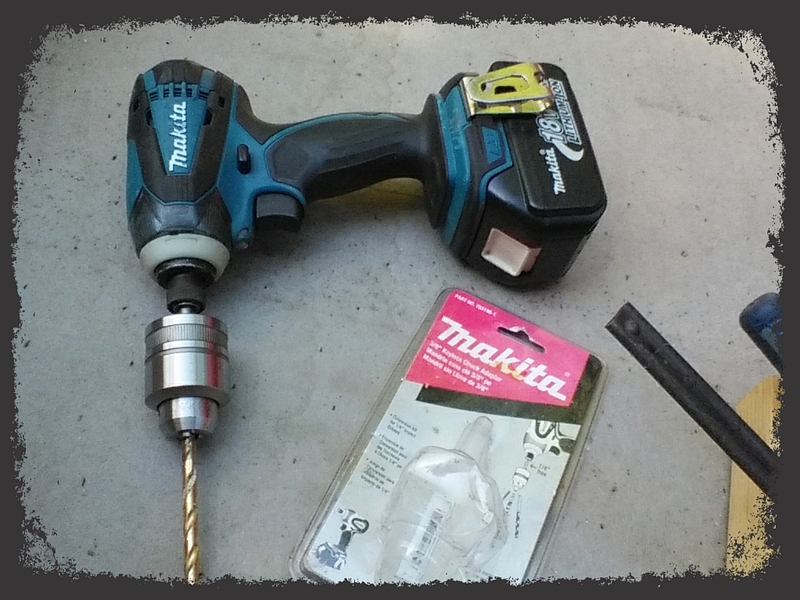 I had to pre-drill holes, and one of the joists did split a bit due to the thickness of the nails, but overall they did work quite well, and hammering those in gave me a good workout, to boot. If only the bit had been a couple inches longer, the joists wouldn’t have split. I don’t know what these nails are made for, but they worked for this. I still haven’t fixed the issue of working around the metal braces, but I think I’ve come up with a plan for handling it. What with the angles and placement of the metal, I’m going to have to be creative. The last picture shows the area I’m referring to, specifically the very front part where the angled metal bar hits the frame. . Need to work around these braces on both sides. 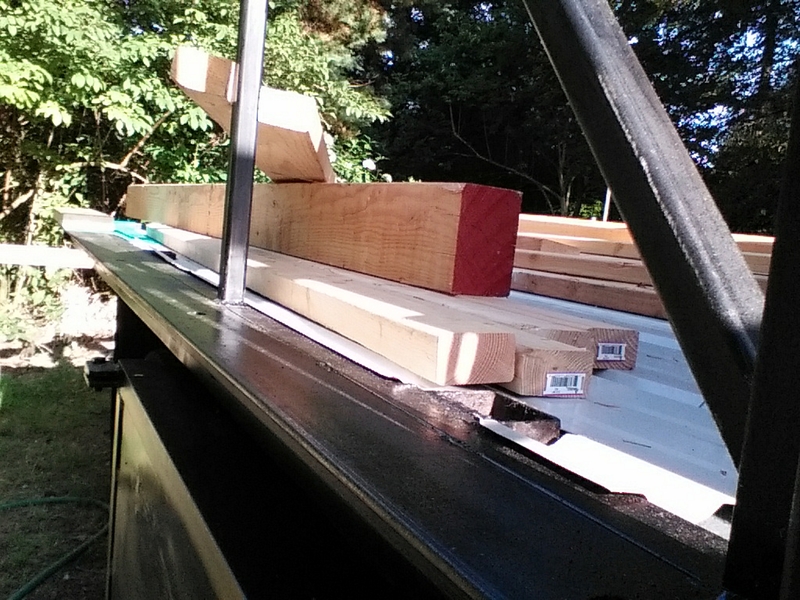 I am going to work on this part today, as I can’t attach the end joists behind the cab until it’s done. 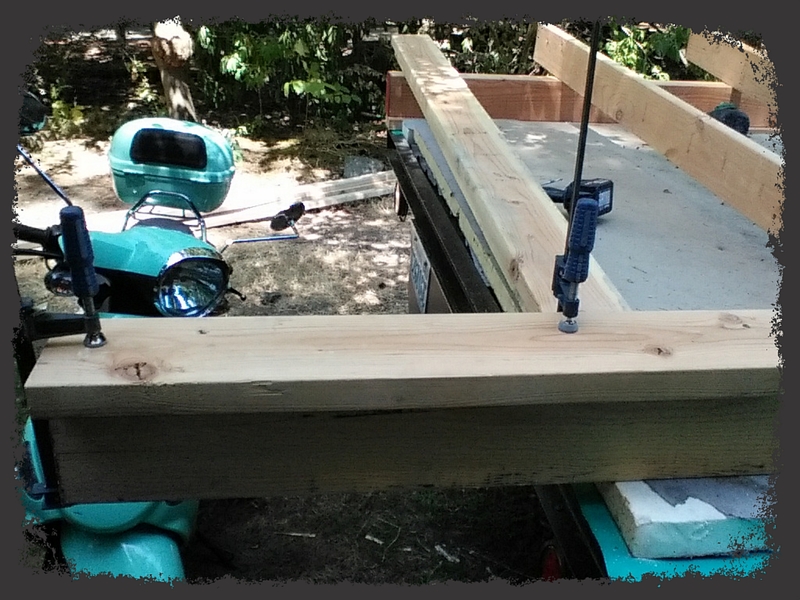 Then I’ll attach the end joists at the other end of the bed, and THEN It’ll be time to wrestle the 3/4″ plywood sheets into place. Google tells me each sheet weighs approximately 70lbs. That’s a lot of awkward weight to heft 4 ft into the air by myself!. Plus, the sheets are stored about 300 ft away so I need to figure out how to even get them to the truck. They will made a good, rigid sub-floor. And the sub-floor is in place, I can start framing the walls. Thankfully the studs are only 2x3s and weigh very little. It will be a nice change. I’m using 2×3 studs because RV windows are designed to take a 3″ thickness at the most, and I want this build to be as quick and easy as possible. The trade-off is less insulation, but even 2 1/2 inches of insulation is better than most campers. It’s also quite easy to heat such a small space. Plus, the floor and the roof will both be quite well insulated. Wish me luck and lots of energy. Hopefully you are all enjoying your day! When I managed a website for a company, I had access to lots of great tools to get the search engines to “notice” the site. I haven’t yet found anything as useful for my blog.